Arriva is a multinational public transport company headquartered in Sunderland, England. It was established in 1938 as T Cowie and through a number of mergers and acquisitions was rebranded Arriva in 1997 and became a subsidiary of Deutsche Bahn in 2010. Arriva operates bus, coach, train, tram and waterbus services in 14 countries across Europe. As at December 2015 it employed 55,000 people and operated 2.2 billion passenger journeys annually. It operates as three divisions: UK Bus, UK Rail and Mainland Europe. The company was founded by TSK Cowie in Sunderland in 1938 as a second-hand motorcycle dealer trading as T Cowie Limited. In 1948 the business was re-launched by Tom Cowie, the founder's son, still selling motorcycles. T Cowie plc was floated in December 1964, and in 1965 it bought out the first of many car dealerships. In 1972 it formed Cowie Contract Hire, which became the largest contract hire business in the UK. In 1980 T Cowie made its first foray into bus operations, buying the Grey-Green operation in London from the George Ewer Group. In 1984 T Cowie plc acquired the Hanger Group, which included Interleasing, a large vehicle leasing business. Further leasing companies acquired were Marley Leasing, RoyScot Drive and Ringway Leasing. Following the retirement of Tom Cowie, the company was renamed Cowie Group plc in April 1994. As part of the privatisation of London bus services, Cowie Group acquired the Leaside Buses and South London Transport business units in September 1994 and January 1995. Cowie plc bought United Automobile Services and British Bus in July and August 1996, both of which had acquired a number of privatised bus companies. As a result of these transactions, in October 1996 Cowie Group was reclassified on the stock exchange from a motor dealer to a transport group. 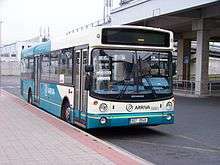 In November 1997 the company was rebranded as Arriva plc. In that year it also bought Unibus in Denmark, its first venture outside the United Kingdom. In June 1999 Arriva sold its vehicle-hire business to General Motors. In February 2000 Arriva purchased MTL Holdings, which included its first UK rail franchises, Merseyrail Electrics and Northern Spirit. In 2002/03 Arriva sold its motor-retailing businesses and in February 2006 it sold its vehicle-rental business to Northgate. In April 2008 the LNWR train maintenance business in England was acquired. In 2010 it was reported that the government-owned railway companies of France (SNCF) and Germany (Deutsche Bahn) were considering making takeover bids for the business. SNCF subsidiary Keolis and Arriva entered discussions regarding a merger, but in April 2010 Deutsche Bahn made a takeover offer for Arriva at £7.75 a share (£1.585 billion). The takeover was approved by the European Commission in August 2010, conditional on Deutsche Bahn disposing of some Arriva services in Germany. The takeover took effect on 27 August 2010, and Arriva was delisted from the London Stock Exchange on 31 August 2010. In late 2011 Arriva acquired Grand Central Railway and sold its Arriva Scotland West bus operation. In May 2013 Arriva purchased Veolia Transport's Central European business with 3,400 vehicles. In May 2013 Arriva entered the Croatian bus market with the purchase of Veolia Transport (Panturist Veolia Osijek) Central Europe with 120 buses. Arriva group bought three medium-sized bus transport companies (Transcentrum Bus s.r.o., Bosák Bus s.r.o. and Osnado s.r.o.) in 2006 and 2007 end established its own rail transport company Arriva vlaky s.r.o. in 2009. These four companies are owned through Arriva holding Česká republika s.r.o. which is owned by the Dutch company Arriva Coöperatie W.A. (majority of 99.9% since 2008). In July 2013, the current Veolia Transport Česká republika a.s. with its four subsidiary companies fell under Arriva group as Arriva Transport Česká republika a.s. The daughter companies were simultaneously renamed and rebranded as Arriva Praha s.r.o., Arriva Teplice s.r.o., Arriva Vychodni Cechy a.s. and Arriva Morava a.s. They operate primarily buses (it is the biggest bus transport operator in the Czech Republic) but also trolleybuses in Teplice (Arriva Teplice) and Desná Railway (Arriva Morava). The two Arriva holdings in the Czech Republic have not any direct interconnection yet. Moreover, the Arriva group operated in the Czech Republic also through the German rail transport company Vogtlandbahn GmbH. Former Abellio's companies Probo Bus and PT Real, purchased in December 2013, are owned by DB Czech Holding s.r.o. which is owned by German DB Mobility Logistics AG. In December 2006 Arriva purchased Transcentrum Bus, operating services in Mladá Boleslav District of the Central Bohemian Region, north east of Prague. In January 2007 Arriva acquired Bosák Bus, which operates to the south west of Prague and the Příbram District of the Central Bohemian Region. In November 2007 Arriva acquired Osnado, which operates bus and coach services in the north of Hradec Králové Region in East Bohemia, in the foothills of Krkonoše mountains. The three bus companies retain their original names but with the Arriva corporate logo and livery. At the turn of 2014/2015, Bosák Bus s.r.o. was merged with Transcentrum Bus s.r.o. and Transcentrum Bus s.r.o. renamed to Arriva Střední Čechy s.r.o. In July 2013 Veolia Transport Česká republika a.s. was purchased with its four subsidiary companies which were renamed Arriva Morava, Arriva Praha, Arriva Teplice and Arriva Východní Čechy. These four companies are owned by holding company Arriva Transport Česká republika. It also operates trolleybuses in Teplice (Arriva Teplice) and trains in Desná Railway (Arriva Morava). In December 2013 Abellio's Probo Bus and PT Real operations were purchased with 110 buses. As at November 2016, Arriva operated 1,960 buses in the Czech Republic. German rail transport company Vogtlandbahn, owned by Arriva since 2004, operated several train routes in the Czech Republic as a subcontractor of České dráhy (fasttrain line alex Nord: München – Regensburg – Hof – Plzeň – Praha, line VB2 Zwickau – Plauen – Bad Brambach – Františkovy Lázně – Cheb – Mariánské Lázně, line VB8 Marktredwitz – Schirnding – Cheb) and GW Train Regio, formerly Viamont (line VB1 Zwickau – Klingenthal – Kraslice – Sokolov). Since December 2010, Vogtlandbahn operates under its own name the line Trilex (Liberec – Zittau – Varnsdorf – Rybniště/Seifhennersdorf). After Arriva was bought by Deutsche Bahn in 2010, Vogtlandbahn was resold to the Italian state railways Ferrovie dello Stato together with Luxembourg infrastructure fund Cube. Between September 2013 and December 2013, Arriva vlaky tried operating a commercial service from Praha Masarykovo nádraží to Kralupy nad Vltavou in competition with subsidised lines of České dráhy. The company did not succeed with its effort to gain a subsidy for it to continue. Four trains on the local Desná Railway, operated by Connex Morava (lately Veolia Transport Morava) since 2002, were taken over by Arriva Morava in July 2013. In March 2016, Arriva introduced a weekly service from Praha to Trencin in Slovakia. It has applied to increase this to twice daily from December 2016. 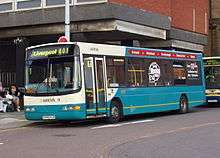 In September 1997 Arriva purchased Unibus. In March 1999 Arriva Denmark expanded with the acquisition of Bus Danmark In April 2001 Arriva acquired Denmark's largest bus operator, Combus with 1,200 vehicles. In August 2004 Arriva purchased Wulff, which operated buses in Jutland and Copenhagen. In 2007 Arriva acquired Veolia Denmark, then Denmark's second largest bus operator with 640 buses. Arriva operates 50% of bus services in Copenhagen and 40% throughout Denmark. In mid-2002 Arriva began to operate services on the Varde to Nørre Nebel line. In March 2012 Arriva was awarded a new franchise until June 2018. In 2003 Arriva began operating an eight-year contract to operate services in mid Jutland. In March 2009 Arriva was awarded a new franchise until December 2018. Arriva operates 17% of the Danish rail network. In 2000 Arriva began operating waterbuses in Copenhagen's harbour. In April 2008 Arriva purchased an 80% shareholding in Eurobus Invest, Hungary's largest private bus operator, which operates services in Hungary and Slovakia. In 2009 Arriva purchased the remaining 20%. Arriva is in a joint venture with Videoton Holding operating as VT Transman. In May 2013 VT Transman began operating two bus contracts in Budapest for eight years. This will see 150 Mercedes-Benz Citaros added to the 225 bus fleet. The joint venture now operates under the VT-Arriva brand. In July 2002 Arriva purchased SAB Autoservizi and SAF - Società Autoservizi Friuli-Venezia Giulia operating in Lombardy, Liguria and Friuli-Venezia Giulia regions of northern Italy. In May 2004 Arriva expanded into the Udine area of the Friuli-Venezia Giulia region, buying 49% of 500 bus SAF, exercising an option in December 2005 to increase its stake to 60%. In October 2005 Arriva began operating in the Piemonte and Valle d'Aosta regions of northern Italy with an 80% shareholding in SADEM, increased to 100% in 2008. In 2006 Arriva purchased a 35% share in Trieste Trasporti, increased in 2007 to 40%. In June 2007 Arriva entered a joint venture with Ferrovie Nord Milano to purchase 49% of 317 bus SPT Linea, which was then renamed ASF Autolinee. In 2008 it took control of Brescia-based SAIA Transporti. In January 1998 Arriva purchased Vancom Nederland followed in December 1998 by Veonn & Hanze. In June 1999 it formed a joint venture with Nederlandse Spoorwegen to operate bus services in Friesland, taking 100% ownership in 2003 and renaming it Arriva Openbaar Vervoer. In 2003 it won further work in Drenthe and Province of Groningen. It won further contracts in 2005 in Drenthe and Waterland and later in the Drechtsteden, Alblasserwaard, Rivierenland, Meierij, Oost-Brabant, and Vijfheerenlanden areas. In 2009 Arriva lost the contracts in Drenthe and Groningen upon retendering but in 2010 won a contract in Achterhoek and retained the Rivierenland contract. From December 2012 Arriva won the contract for Zuid Holland North, around Leiden, Alphen aan den Rijn and Gouda and in Friesland around Leeuwarden. Arriva established the joint venture NoordNed with Nederlandse Spoorwegen in 1999, taking 100% ownership in 2003, and dropping the name NoordNed two years later. In 2005 it secured a 15-year contract to operate trains from Groningen to Leeuwarden, Delfzijl, Roodeschool and Nieuweschans. It also secured a contract to operate trains from Leeuwarden to Harlingen Haven and to Stavoren. Later that year it secured a contract to operate trains from Dordrecht to Gorinchem and on to Geldermalsen (MerwedeLingelijn). In 2012 Arriva commenced operating trains in the Achterhoek and between Zwolle and Emmen. These services operate under the Spurt brand. On 21 June 2013 Arriva was selected to operate a new service between The Hague and Brussels. Service was set to start in December 2015, but the project was cancelled in 2014 because the involved parties could not agree upon a final business case and because NS reactivated the original service to Brussels, making the new Arriva service unnecessary. The Province of Limburg awarded a contract in June 2015 to Arriva to provide for the entire public transport (buses and five regional rail lines) in Limburg from December 2016 up until 2031. Abellio has originally been named the preferred bidder, but after it was discovered Abellio had gained some information that was not available to the other bidders, the contract was withdrawn. Another tenderer, Veolia, announced they will object to the decision of the province. In May 2013 Arriva entered the Polish market through its acquisition of Veolia Transport Central Europe with 840 buses. Arriva formed Arriva PCC, a joint venture with PCC Rail in December 2006. In December 2007 Arriva commenced operating services on all non-electrified lines in the Kuyavian-Pomeranian Voivodeship. In June 2010 Arriva took 100% ownership of the business and renamed it Arriva RP. In December 2010 Arriva RP won a 10-year extension. In December 2013 Arriva will start operating trains on four electrified lines in the Kujawsko-Pomorskie Voivodship for two years with 12 existing trains. In November 2000 Arriva purchased João Carlos Soares e Filhos, Viacao Costa & Lino Lda, Ami-Transportes and Abílio da Costa Moreira & C Lda who were running inter-urban local bus services in the north west of Portugal. In June 2002 Arriva bought a 51% shareholding Transportes Sul do Tejo, a scheduled bus and coach operator in the growing commuter region south of Lisbon. In September 2003 Arriva exercised an option to buy the remainder of the company. In May 2006 Arriva acquired a 21.5% share of leading transport company Barraqueiro, with bus and rail operations in and around Lisbon, increasing the shareholding in January 2008 to 31.5%. Arrive operates the city bus services in Guimarães and Vila Nova de Famalicão. In May 2013 Arriva entered the Serbian bus market with the purchase of Veolia Transport Central Europe (Veolia Transport Litas in Požarevac and Veolia Transport Luv in Belgrade) with 250 buses. In January 2015, Arriva commenced operating bus services in Niš with 33 buses. In July 2008 Arriva entered the Slovakian bus market with the purchase of an 80% shareholding in Eurobus Invest. In July 2015, it purchased SAE Liorbus and SRD Trnana. Coach services are operated under the Arriva Express brand. As at November 2016, Arriva employed 2,390 people and operates 1,335 buses. In May 2013 Arriva entered the Slovenian bus market with the purchase of Veolia Transport Central Europe (Veolia Transport Štajerska, Veolia Transport Dolenjska and Primorska) with 270 buses. In July 1998 Arriva purchased Mercancia Ideal Gallego followed in September 1999 by Transportes Finisterre, both in Galicia. Their services cover three of the four provinces in the region: A Coruña, Lugo and Ourense, including part of the famous Santiago pilgrimage route. In January 2002 Arriva commenced operating in Majorca with the purchase of Autocares Mallorca and Bus Nord. These operate on the northern and western parts of the island, linking the capital Palma with towns such as Soller, Inca and Alcúdia. In 2007 Arriva acquired Autocares Fray Escoba and Esferain Madrid. In July 2008 Arriva acquired Empresa de Blas y Cia, which operates routes between Madrid and its southwestern suburbs (Alcorcón, Móstoles, Villaviciosa de Odón, Navalcarnero...), and between those suburbs. Arriva has operated bus lines in southern Sweden/The Skåne Region since 1997 when it purchased Unibus of Denmark. Arriva operates bus lines in some municipalities of Stockholms län: Sigtuna kommun, Upplands Väsby kommun and Ekerö kommun. In August 2012 Arriva commenced operating in the Bromma, Täby and Solna parts of Stockholm with 255 buses under a 12-year contract with the regional transport authority. In January 2013 a further 229 buses were added. Arriva has operated services in the Halland Region since June 2010, partly taking over services from Swebus. In June 2007 Arriva won a nine-year franchise for the Pågatåg regional rail services in Skåne County, south Sweden. In 2009 Arriva expanded its rail operations in the country with a new contract operating the Kinnekulletåget between Göteborg and Örebro. In December 2010 DB Regio Sverige AB started to operate regional trains in Östgötapendeln. In November 2011 the company was renamed Arriva Östgötapendeln AB. Since August 2012, Arriva has operated Stockholm area tramlines Tvärbanan, Nockebybanan as well as the light rail systems Lidingöbanan and Saltsjöbanan. In January 2013, Arriva commenced operating commuter trains on Roslagsbanan north of Stockholm. 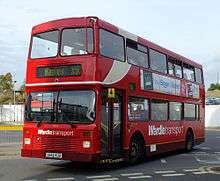 Wikimedia Commons has media related to Arriva Buses GB. Arriva operates 5,900 buses in London, the north east, north west and south east of England, Yorkshire, the Midlands and Wales. Arriva Transport Solutions provides non-emergency ambulance services, typically to convey disabled patients to and from hospital out-patient appointments. These services, formerly provided by ambulance services are now awarded by competitive tender. The company has been running these services in Nottinghamshire, Leicestershire and Rutland since 2012. A report by the Care Quality Commission in 2014 by the CQC said that patients were "often" arriving late for appointments, and taxi drivers with "poor attitudes" being used when other resources were unavailable. Following its successful bid over the rival North West ambulance service for non–emergency transport, in Greater Manchester Arriva admitted it had submitted incorrect performance figures which had earned it a £1.5 m bonus. Arriva had been the subject of many complaints about its service. Comparisons were drawn with misreporting in the UK Serco scandal and MPs said the Serious Fraud Office may need to be involved. Arriva TrainCare (previously LNWR) operates train maintenance depots at Bristol, Cambridge, Crewe, Eastleigh and Newcastle. Arriva Trains Wales/Trenau Arriva Cymru operates the majority of rail services in Wales. The Wales & Borders franchise runs from 7 December 2003 until 13 October 2018. Following the purchase of Arriva by Deutsche Bahn in August 2010, Arriva UK Trains expanded to take over Deutsche Bahn's existing DB Regio UK division which consisted of Chiltern Railways, Tyne & Wear Metro and London Overground Rail Operations. Arriva UK Trains wishes to expand the number of UK Rail businesses it operates by developing open access operations and successfully bidding for further Department for Transport rail franchises. Alliance Rail Holdings continues to develop new open access proposals following the rejection of its initial plans by the Office of Rail Regulation in 2011. During 2011/12 Arriva's applications to bid for the InterCity West Coast, Greater Anglia, Essex Thameside and Thameslink franchises were all rejected by the Department for Transport. Following this run of failure Arriva was publicly critical of the government's prequalification process and called for it to be abolished. 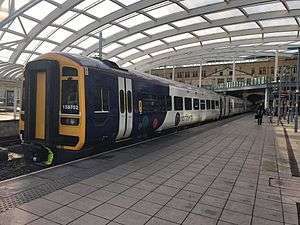 However Arriva was subsequently shortlisted for the Greater Western, Crossrail, Caledonian Sleeper and ScotRail franchises. 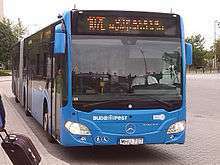 In February 2005 Arriva purchased Sippel, a bus operator in the Rhine Main. In May 2006 Verkehrsbetriebe Bils was purchased followed in December 2006 by 80% of NeiBeverkehr. 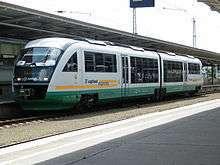 In April 2004 Arriva purchased Prignitzer Eisenbahn Gruppe which operated five franchises. In October 2004 a 77% shareholding, increased later in the year to 93%, was purchased in Regentalbahn. In 2007 Arriva purchased an 85% shareholding in Osthannoversche Eisenbahnen. As part of the takeover of Arriva by Deutsche Bahn, Arriva's German railway operations were sold to Ferrovie dello Stato to comply with a European Commission condition. These are now branded as Netinera. In July 2011 Arriva commenced operating a ten-year concession to operate all scheduled bus services on Malta and Gozo. Arriva held a 67% shareholding with the local Tumas Group owning the remaining 33%. The main fleet of Arriva Malta was formed of 172 new King Long buses. These were supported on high-density routes by 68 former Arriva London Mercedes-Benz O530G Citaro articulated buses. Ten hybrid Optare Solos and two Bluebird mini-buses for use in the city of Valletta were also purchased. An assortment of the newest buses from the former owner/driver pre-July 2011 operation were also acquired and refurbished to bring them broadly into line with the rest of the fleet. This included the fitting of air conditioning and CCTV equipment and rebranding into standard Arriva livery for daily use alongside the main fleet. These included buses built by SCARNIF, MCV, BMC, King Long and Saracakis among others, with the main common factor being that they are all fully automatic and low floor designs. Arriva has been harshly criticised both by commuters and by the government agency Transport Malta for consistently failing to keep up standards. On 14 November 2012, Arriva was harshly reprimanded by Transport Malta and given until the end of the month to bring up all its routes to 100% efficiency before TM deploys its own shuttles at Arriva's expense. In August 2013, the Government of Malta instructed Arriva Malta to remove the articulated buses from service, pending investigation following three major fire outbreaks in the span of 48 hours. The fires destroyed the buses and in one case caused extensive damage to some nearby vehicles belonging to MaltaPost, the country's postal operator. Nobody was injured in these incidents. Like in the UK when the same buses had caught fire, these buses became a popular joke in conversations and social media sites. By the end of December 2013 Arriva had run up losses of €50 million in two and a half years. On 1 January 2014 Arriva ceased operations in Malta having been nationalised by the Maltese government as Malta Public Transport, with a new bus operator to take over its operations in the near future. In 2016 Arriva hit controversy when it broke European Union laws by refusing to interview a UK national for a UK job because the applicant was not Romanian. Prior to being rebranded as Arriva in November 1997, the Cowie fleets generally were still trading under their pre-privatisation names with individual liveries. As part of the rebranding the operations were renamed as Arriva Derby, Arriva Fox County etc. A uniform livery of aquamarine (pantone 321) with a cream coloured semicircle at the front with a yellow skirt and signwriting was adopted. This livery was adopted by most by Arriva's European acquisitions as well as Arriva Trains Northern and Arriva Trains Wales. The same livery was applied to the Arriva London fleet albeit with red in lieu of aquamarine to comply with a Transport for London requirement for buses to be 80% red. London vehicles are now painted all-over red to comply with Transport for London's amended requirements. In the mid-2000s, an aquamarine livery with less cream, a dark blue skirt and yellow stripe was adopted for some longer distance services in the United Kingdom. Dubbed the interurban livery, in September 2009 it was decided to adopt this livery as standard for all UK buses. Most European operations retain the old livery, although some Czech buses have also received it. In December 2008 Arriva Trains Wales unveiled a dark blue livery on its Mark 2 carriages, this has since been adopted as its standard livery. Arriva has introduced the Sapphire brand for premium services in the UK, in similar fashion to Stagecoach Gold with buses fitted with leather sets and WiFi. 1 2 3 4 5 6 History and growth Arriva Archived 20 September 2008 at the Wayback Machine. ↑ Keleny, Anne (1 February 2012). "Sir Tom Cowie: Founder of a transport empire". The Independent. London. ↑ The Arriva London Story. Arriva London. Archived 11 November 2013 at the Wayback Machine. ↑ "All change as Cowie swaps to buses" Archived 4 October 2013 at the Wayback Machine.. Lancashire Telegraph (Blackburn). 8 October 1996. Archived 4 October 2013 at the Wayback Machine. ↑ Cope, Nigel (12 June 1999). "GM unit buys Arriva car hire in £513m deal". The Independent. London. ↑ Recommended Cash Offer for MTL Services Archived 14 April 2016 at the Wayback Machine.. Arriva. 18 February 2000. ↑ "Arriva buys MTL for £84m". Rail (Peterborough). Issue 378. 8 March 2000. page 13. ↑ Muspratt, Caroline (31 January 2006). "Arriva sells off car rental arm". The Daily Telegraph. London. ↑ "Arriva acquires LNWR" Archived 13 April 2016 at the Wayback Machine.. Railway Gazette (London). 18 November 2008. ↑ "Arriva moves ahead on bid battle hopes". The Guardian 24 March 2010. ↑ "Response to Press Reports Regarding Deutsche Bahn AG" (Press release). Arriva. 19 April 2010. Archived from the original on 4 June 2010. ↑ "Deutsche Bahn buys Arriva for £1.5bn". Financial Times (London). 22 April 2010. ↑ "EC approves DB's takeover of Arriva". Railway Gazette International. London. 11 August 2010. ↑ "Scheme of Arrangement becomes effective" (Press release). Arriva. 27 August 2010. Archived from the original on 19 October 2012. ↑ "Delisting of Arriva plc Shares" (Press release). Arriva. 31 August 2010. Archived from the original on 20 May 2012. 1 2 "Arriva acquires open access operator Grand Central Railway" (Press release). Arriva. 4 November 2011. Archived from the original on 20 May 2012. 1 2 "Arriva in Grand Central Railway takeover" Archived 13 April 2016 at the Wayback Machine.. BBC News. 4 November 2011. 1 2 "Arriva exits Scotland with Sale to McGill's" Archived 6 February 2013 at the Wayback Machine. Bus & Coach Professional 14 December 2011 Archived 6 February 2013 at the Wayback Machine. 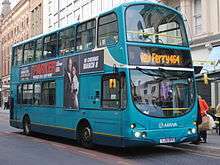 1 2 "Bus firm McGill's to take over rivals Arriva". BBC News. 13 December 2011. 1 2 "DB acquires Central European business operations from Veolia" Archived 13 April 2016 at the Wayback Machine.. Deutsche Bahn. 16 May 2013. 1 2 3 4 5 "Arriva takes Veolia business" Archived 11 November 2013 at the Wayback Machine. Bus & Coach Professional 20 May 2013 Archived 11 November 2013 at the Wayback Machine. 1 2 "Arriva takes the lead in central and east Europe" Archived 13 April 2016 at the Wayback Machine.. Passenger transport. 22 May 2013. 1 2 3 "Arriva acquires Veolia Transport Central Europe". Railway Gazette International. May 2013. ↑ Arriva: Společnost Veolia Transport Central Europe součástí skupiny Arriva, BUSportál.cz, 16. May 2013 Archived 4 March 2016 at the Wayback Machine. 1 2 3 4 5 6 Arriva Denmark Archived 14 September 2008 at the Wayback Machine. ↑ "Arriva agrees to purchase Veolia Danmark" (Press release). Arriva. 4 July 2007. ↑ "Arriva reveals £150m Danish franchise deal" Archived 28 October 2014 at the Wayback Machine.. The Scotsman (Edinburgh). 7 January 2002. ↑ "Arriva Danmark signs new Vestbanen contract" Archived 6 January 2016 at the Wayback Machine.. Railway Gazette (London). 29 March 2012. ↑ "Arriva Denmark extends Vestbanen contract" Archived 28 May 2016 at the Wayback Machine.. Global Rail News. 30 March 2012. ↑ "Jylland contract stays with Arriva" Archived 13 October 2012 at the Wayback Machine.. Railway Gazette (London). 13 March 2009. 1 2 "Arriva moves into Hungary and Slovakia" Archived 28 October 2014 at the Wayback Machine.. Bus & Coach Professional. 23 April 2008. Archived 28 October 2014 at the Wayback Machine. ↑ Hungary Arriva Archived 27 December 2013 at the Wayback Machine. ↑ "Budapest bus contracts strengthen Arriva's Hungarian presence" (Press release). Arriva. 7 November 2012. ↑ "Budapest bus contracts strengthen Arriva's Hungarian presence" Archived 28 March 2016 at the Wayback Machine.. Eurotransport Magazine. 7 November 2012. 1 2 3 4 Arriva Italy Archived 19 September 2008 at the Wayback Machine. ↑ "Arriva grows its position in the Italian public transport market" (Press release). Arriva. 4 May 2004. ↑ "Arriva joint venture acquires 49 per cent of Italian bus operator" (Press release). Arriva. 28 June 2007. ↑ "ASF Autolinee - Azienda - Storia" [ASF Bus - Company - History] (in Italian). ASF Autolinee. Archived from the original on 15 October 2012. Retrieved 22 October 2012. 1 2 3 4 5 6 Netherlands Arriva Archived 27 December 2013 at the Wayback Machine. 1 2 3 Arriva Timeline Arriva Archived 16 February 2009 at the Wayback Machine. ↑ "Bus contract win in the Netherlands" .Eurotransport. 12 April 2012. Archived 1 April 2016 at the Wayback Machine. ↑ "Arriva expands with new contract" Archived 11 November 2013 at the Wayback Machine.. Bus & Coach Professional. 7 May 2012. Archived 11 November 2013 at the Wayback Machine. ↑ "Arriva begins to operate four contracts in the Netherlands" (Press release). Arriva. 12 December 2012. ↑ "Arriva selected to operate Den Haag - Brussels inter-city service" Archived 11 December 2015 at the Wayback Machine.. Railway Gazette (London). 21 June 2013. ↑ "Arriva to operate The Hague - Brussels services" Archived 7 March 2016 at the Wayback Machine.. International Rail Journal. 21 June 2013. ↑ "Archived copy". Archived from the original on 22 August 2016. Retrieved 2016-06-15. ↑ "Archived copy". Archived from the original on 18 May 2015. Retrieved 2016-06-15. ↑ "Provincie Limburg - Provincie kiest voor Arriva". www.limburg.nl. Retrieved 2015-06-02. ↑ "Limburg gunt concessie openbaar vervoer aan Arriva". NRC Handelsblad. Amsterdam. 2015-06-02. ↑ "Veolia protests as Arriva is awarded Dutch contract". Buses. Issue 724. July 2015. p. 24. ↑ "Freightliner prepares to compete in Poland". Railway Gazette International. March 2007. 1 2 Rolf Andersson (October 2007). "Skåne springboard as Arriva expands". Railway Gazette International. 1 2 Arriva Poland Arriva Archived 11 November 2013 at the Wayback Machine. ↑ "Arriva awarded 10-year Polish operating contract" Archived 6 January 2016 at the Wayback Machine.. Railway Gazette (London). 2 November 2010. ↑ "Rail tender win for Arriva in Poland" (Press release). Arriva. 2 July 2013. ↑ "Arriva to operate additional train services in Poland" Archived 22 April 2016 at the Wayback Machine.. Global Rail News. 2 July 2013. 1 2 3 Arriva Portugal. Arriva. Archived 11 November 2013 at the Wayback Machine. 1 2 Arriva Spain Arriva Archived 19 September 2008 at the Wayback Machine. 1 2 Arriva Sweden Arriva Archived 24 July 2013 at the Wayback Machine. ↑ Arriva vinner trafik i Halland Archived 5 March 2016 at the Wayback Machine. ↑ "Arriva patient transport promises improvements". BBC News. 18 September 2014. Retrieved 30 September 2014. ↑ Mark Leftly (8 November 2015). "Arriva may face SFO fraud inquiry over NHS deal". The Independent. Retrieved 12 November 2015. ↑ Arriva welcomes new CrossCountry rail franchise award Arriva 10 July 2007 Archived 20 May 2012 at the Wayback Machine. 1 2 "Rail Professional interview: Bob Holland". Rail Professional. October 2011. Archived 6 February 2013 at the Wayback Machine. ↑ "Alliance Rail Holdings Restates its Position on New Rail Services for the West Coast Main Line" (Press release). Alliance Rail Holdings. 4 May 2012. ↑ "Bidders to oversee improvements on rail franchises announced" (Press release). Department for Transport. 29 March 2012. ↑ King Long handover busandcoach.com 10 April 2011 Archived 6 November 2013 at the Wayback Machine. ↑ Peregrin, Christian (18 November 2012). "Arriva is given a harsh warning and a deadline". Times of Malta. Valletta. Retrieved 25 June 2013. ↑ "Updated - Ministry, Transport Malta, tell Arriva to withdraw all bendy buses". timesofmalta.com. 27 August 2013. Retrieved 2013-08-28. ↑ "Arriva Future Decided" Archived 27 June 2016 at the Wayback Machine.. Di-Ve Malta News. 22 December 2013. ↑ "Archived copy". Archived from the original on 23 March 2016. Retrieved 2014-10-26. "New Year in, Arriva out". Times of Malta. 23 December 2013. ↑ Arriva launches Sapphire upgrade busandcoach.com 21 February 2013 Archived 26 February 2014 at the Wayback Machine.